Habit: Annual to perennial herb, generally scapose. Stem: decumbent to erect. Leaf: generally basal, veins generally +- parallel. Inflorescence: spike, generally dense; flowers few to many, cleistogamous or opening (both). Flower: generally bisexual; calyx deeply 4-lobed, lobes generally overlapped, persistent, margin generally scarious; corolla radial or bilateral, salverform or cylindric, scarious, persistent in fruit, colorless except for lobe midribs or not, lobes 4, spreading to erect; stamens generally 4; ovules several per chamber, stigma long, hairy. Fruit: circumscissile +- at or proximal to middle. Seed: 2--many, gelatinous when wetted. Species In Genus: +- 250 species: worldwide, especially temperate; some weedy, some (especially Plantago afra L., psyllium) cultivated for laxative. Etymology: (Latin: sole of foot) Note: Plantago sempervirens Crantz, Plantago heterophylla Nutt., reported but not documented, possibly naturalized in California. Unabridged Note: 2 species reported but not documented for California: Plantago sempervirens Crantz, native to southern Europe, Turkey, differs from Plantago arenaria in, e.g., habit (dwarf shrub vs annual), corolla tube (4--5 vs 3.5--4 mm), fruit (4--5 vs +- 2 mm); Plantago heterophylla Nutt., native to southeastern North America, differs from Plantago elongata in, e.g., seed number, size [10--25(30), 0.5--0.8 mm vs (3)4--9(12), 1.5--2.5 mm], corolla lobe orientation (generally spreading vs generally 1 erect, 3 spreading or reflexed). Habit: Annual; drying light green, hairs +- dense. Leaf: 2--10 cm, linear or narrowly oblanceolate, entire. Inflorescence: often many, 2--18 cm including peduncle; spike 1--6 cm, +- cylindric, +- wider at base, +- densely woolly, hairs on peduncle nearly always ascending, each in diam +- 2 × those on leaves; peduncle not grooved; bract exserted (proximal) or not, generally 1--2.5 × calyx, linear, green midrib generally reaching tip. Flower: abaxial sepals united at base, scarious parts free; corolla lobes spreading (or 1 erect), 1.5--2 mm, ovate, +- acute. Seed: 2, +- 3 mm. Chromosomes: 2n=20. 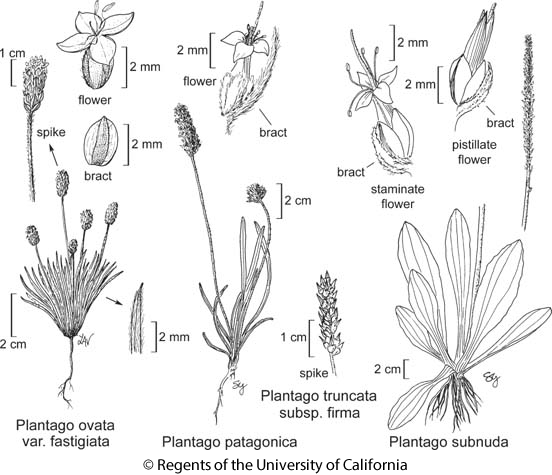 Citation for this treatment: Thomas J. Rosatti 2012, Plantago patagonica, in Jepson Flora Project (eds.) Jepson eFlora, http://ucjeps.berkeley.edu/eflora/eflora_display.php?tid=38590, accessed on April 22, 2019. SnGb, SnBr, PR, D; Markers link to CCH specimen records. Yellow markers indicate records that may provide evidence for eFlora range revision or may have georeferencing or identification issues. Purple markers indicate specimens collected from a garden, greenhouse, or other non-wild location.